DOMOTEX 2009 received wonderful visibility from the flooring media. In a previous post, Rita shared with you the highlights covered in her interview with FloorDaily. This post covers the highlights from our interview with TalkFloor's Dave Foster. 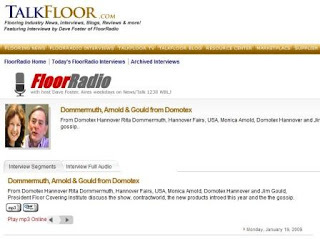 On January 19, 2009, Rita Dommermuth, Monika Arnold and I spoke with Dave Foster recapping DOMOTEX 2009. The interview lasts 39 minutes. Always Something New @ DOMOTEX. With the backdrop of a global recession, some predicted DOMOTEX 2009 to be a bust. Instead, Rita reported the show had a record number of exhibitors with attendees filling every hall. Officially, attendance was down slightly but I was impressed with how upbeat show attendees and participants were. Americans were well represented in the American Floorcovering Alliance (AFA) and expanded National Wood Flooring Association (NWFA) spaces. These organizations, with economic support from the Georgia Department of Economic Development and the American Hardwood Export Council respectively, had provided affordable exhibition opportunities for American manufacturers and service providers to show their goods. Combined with stand alone booths from Mohawk, Beaulieu, United World Logistics and others. Buyers from around the world visited current suppliers and searched for new opportunities. While floor covering business is down 20% globally, Rita said the other 80% must have been shopping and buying at DOMOTEX. She saw many buyers from fast growing areas like Asia and the Middle East. Rita and Monika reported that they heard upbeat reports because the quality of visitors was rated very high by everyone. The international flavor of the exhibition was proven by more than 80% of the exhibitors and nearly two thirds of the attendees coming from outside of Germany. Filling 13 large exhibition halls is not easy but nearly 1,400 exhibitors and 40,000 visitors needed that much space. Complete halls were filled with handmade oriental rugs from every corner of the globe; a literal magic carpet bonanza. Other halls featured laminates or wood, vinyl and luxury vinyl tile, broadloom carpet, fibers, installation and maintenance equipment. Monika explained that one highlight of the show was contractworld, a designated commercial exhibition hall that drew 2,500 architects and designers to view products, listen to presentations and network with their peers. Clearly “green” was a major part of every exhibitor’s presentation. I told Dave that while American’s are catching onto this concept, it is in full bloom in the rest of the world. Evidence was seen in product innovations, in seminar topics and in the buyers’ questions. Europe already has strict regulations regarding Volatile Organic Compounds (VOCs), formaldehyde, water usage and recyclability. While Americans took a large step forward with the Lacey Act Amendments (2008), Europe is quickly moving down a similar path. I always find something new that makes my trip to DOMOTEX worthwhile. This year’s “find” was an robotic wood floor covering sander. Guided by lasers, this R2D2 looking robot, methodically sands an entire room evenly without human intervention. Advancements in products and installation systems were shown in click luxury vinyl tile and click ceramic to name a few otherse. There is always something new at DOMOTEX. What better venue or economically efficient method is there to show a new product or design and get immediate market feedback? Dave broadcasted the interview on his Dalton radio show and then printed excerpts on his Internet site to update his readers. As good as Rita, Monika and I tried to be in describing the show, there was no way we could capture the flair, the products or the excitement of the DOMOTEX experience.